The online version of the historical exhibit installed on Central City Concern’s Click here => Golden West Building. This permanent exterior exhibit, installed in 2009, tells a social and ethnic story of the vibrant African-American community in Portland in the early 1900s and the successes and challenges of its residents. The exhibit – featuring six panels and a soundtrack– can be seen and heard by the public on both sides of the Golden West Building, 707 NW Everett at Broadway. 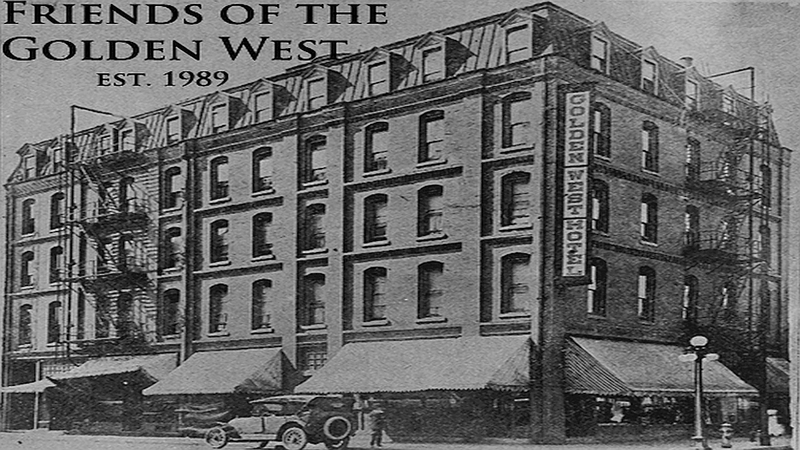 The Golden West Hotel was a vibrant place of employment and socializing for Portland’s African American community in the early 1900s. Display panels and audio narrative detailing this history can be found on the W. Broadway side of the building or on-line here: Golden West Building. Built in the late 19th century, this building began life as the Tremont House, according to the Sanborn Insurance Maps of the city. Its features include a brick facade and Mansard roof. Architect Emil Schacht was engaged in 1912 to enlarge the hotel by one third. Schacht’s addition conformed to the building’s original design, an early example of sensitive renovation. The exhibit celebrates the rich history of the Golden West, the former center of Portland’s African-American social and business life in the first decades of the twentieth century. Primary funding for this project was from a Vision into Action grant by the City of Portland. Additional support provided by Oregon Humanities. Other funders include Central City Concern and SERA Architects (in-kind).